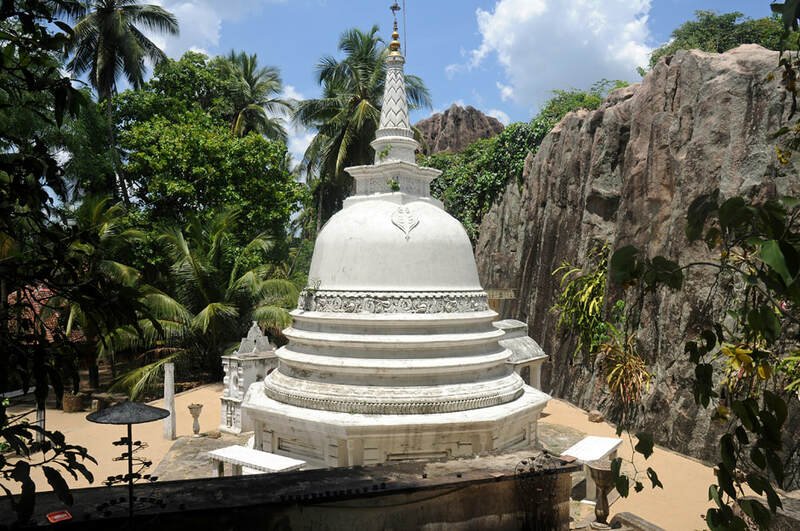 Koskandawala is a typical Sri Lankan temple with a white pagoda surrounded by gneiss rocks. The full name of the Buddhist monastery, which is recognized as an archaeological site by the Srri Lankan government, is Sri Sunandarama Pirivena Rajamaha Viharaya. The temple is located in only 3 km distance from Yakkala, which is a town at the Colombo-Kandy main road (A1). Koskandawala is located in between Yakkala, Pilikuttuwa and Maligatenna. This area crowded with ancient temples, also including the temples of Varana and Petthagangala further east, is rarely visited by foreigners, though it’s close to Colombo and Negombo and the major streets and railway lines. The historical name of this area is Siyane Korala. It’s the homeland of Sri Lanka’s first Prime Minister, Senanayake, once leader of the UNP, as well of the most famous family in Sri Lankan politics, the Bandaranayakas, who founded the rivalling SLFP. The borders of Siyana Korale are not well-defined, as it’s not an administrative unit any more. Siyane Korale was a lowland area controlled by the Dutch but often raided by the Kandyan kings. For the Roman Catholic Church, the Siyana Korale mission was the entire region between the hinterland of Negombo and the Kandyan hillcountry and in between the rivers of Kelani Ganga and Maha Oya. The temples mentioned above, now belong to the Mahara Division of Gampaha District, with the exception of Koskandawala, which lies in the southwesternmost tip of Attanagala Division.